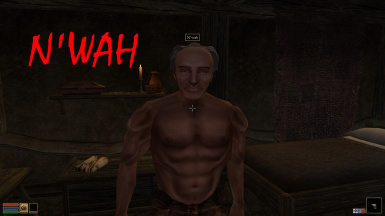 Every non-dunmer's name has been replaced with N'wah. Ask me if you want to use something. 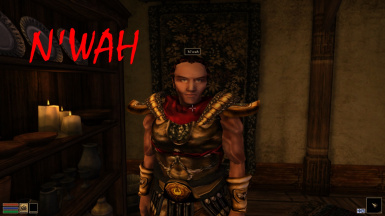 It replaces the names of every non-Dunmer NPC with 'N'wah". This affects their name when you hover over them only, not how they are referred to in dialogue. The package also includes instructions to patch your total installation so that other mods you have installed will also be affected. The idea for this mod stemmed from a discussion on the Elder Scrolls Lore forum. I'm just imagining something where every non-dunmer's name was replaced with N'wah. Since I typically play as a Dunmer, I decided I had to experience the game like this. The first thing I tried was to replace all non-Dunmer (hereafter referred to as n'wah) dynamically, in game by using MWSE. Abot helped me get an edited version of Fliggerty's detect life script working, but due to the unstable nature of MWSE, it caused frequent crashes. So abot and I worked on creating a tes3cmd command and perl code which could create a patch in a semi-automated fashion. 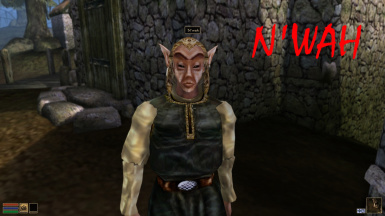 NWAH.esp - replaces the names of all n'wah with "N'wah" in the Morrowind.esm (only edits the FNAM property, so dialogue is unaffected). 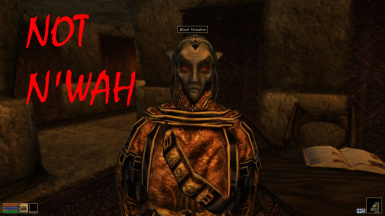 Batch files and detailed instructions to patch all your active mods and replace those pestilent foreign names with the more politically correct: "N'wah"